"The additional words for you and for many, are taken, some from Matthew, some from Luke, but were joined together by the Catholic Church under the guidance of the Spirit of God. They serve to declare the fruit and advantage of His Passion. For if we look to its value, we must confess that the Redeemer shed His blood for the salvation of all; but if we look to the fruit which mankind have received from it, we shall easily find that it pertains not unto all, but to many of the human race. When therefore ('our Lord) said: For you, He meant either those who were present, or those chosen from among the Jewish people, such as were, with the exception of Judas, the disciples with whom He was speaking. When He added, And for many, He wished to be understood to mean the remainder of the elect from among the Jews or Gentiles. I will leave the arguments for points 1 and 2 for another day, and call the readers attention to the oft overlooked third argument. "The words mystery of faith, which are subjoined, do not exclude the reality, but signify that what lies hidden and concealed and far removed from the perception of the eye, is to be believed with firm faith. In this passage, however, these words bear a meaning different from that which they have when applied also to Baptism. Here the mystery of faith consists in seeing by faith the blood of Christ veiled under the species of wine; but Baptism is justly called by us the Sacrament of faith, by the Greeks, the mystery of faith, because it embraces the entire profession of the Christian faith. Another reason why we call the blood of the Lord the mystery of faith is that human reason is particularly beset with difficulty and embarrassment when faith proposes to our belief that Christ the Lord, the true Son of God, at once God and man, suffered death for us, and this death is designated by the Sacrament of His blood." Pre-Vatican II theologians differed as to what constituted the words effectuating Transubstantiation. Some held the "short form" theory, that only the words "This is the Chalice of My Blood..." are sufficient. Others, including Aquinas, hold that all the words, the "long form" is necessary. Since the Church has not definitively pronounced which is correct, the safe course of using the long form and omitting nothing, must be held in practice. To do otherwise would put the validity of the Mass at stake. 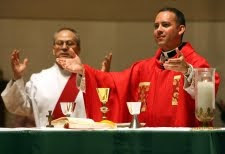 Assuming we have a validly ordained priest, and further assuming that pronouncing the Words of Consecration as an "Institution Narrative" does nothing to invalidate the Sacrament, the omission of the words "the mystery of faith" render validity dubious at best. Furthermore, the phrase was taken out of the Consecration Formula and placed before the so-called "Memorial Acclamation" which states "Christ has died, Christ is risen, Christ will come again." That is NOT the "mystery of faith"--- it actually is supposed to denote the alleged Transubstantiation that just took place! How many members of the Vatican II sect know this and understand what it means? It's ambiguous place outside the Consecration Formula, lending itself to be misunderstood, is a subtle DENIAL of the Real Presence. In other words, the Novus Ordo Missae contains a denial of the Real Presence doctrine. For if a given expression has always had a particular meaning in its original context, and the very same expression is used in the very same setting but with an altogether different meaning attached by its ambiguous placement, which different meaning is explicitly acclaimed, then one may reasonably infer that the original meaning was not only suppressed, but that the innovator has intended its denial. This shows a defect of intention within the rite which is another reason to hold it as dubious at best! "And this does not change the fact that all those words which the Latin Church uses in the consecration of the wine are of the essence of that form. For it is one thing to say that all those words are not of the essence of the form as such, and it is another thing to say that they are not of the essence of the form that the Latin Church uses. Therefore we say that although all those words are not of the essence of the form as such, they are of the essence of the form in which they are found, such as that form which the Latin Church uses. "(See Controversiae theologicae selectae pgs 213-218--Emphasis mine). Couldn't the Church change the form? In a word, "No." As Pope St. Pius X taught, "[I]t is well known that to the Church there belongs no right whatsoever [emphasis mine] to innovate anything touching on the substance of the sacraments (Pope St. Pius X, in the letter Ex quo, nono, Dec. 26, 1910). The words have been placed outside the Consecration Formula, leading people to believe "the mystery of Faith" refers to Christ having died, risen, and coming again on the Last Day. This is a tacit denial of the Real Presence and gives the rite a defective intention. 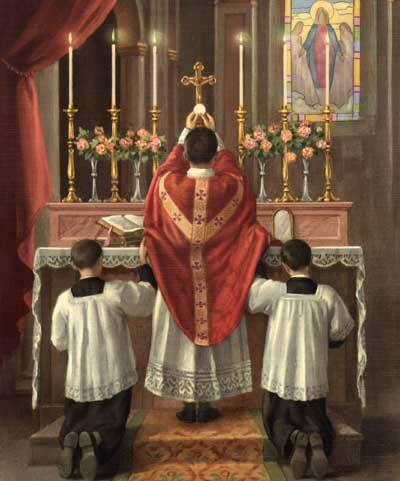 If the rite does not intend Transubstantiation to occur, then it would be invalid. The Church has "no right whatsoever" to innovate anything touching on the substance of the sacraments, as Pope St. Pius X taught. Hence, by changing the words "for all" back to "for many" in their 2011 edition of the "Novus Ordo Mass", they still did nothing towards making it valid even presupposing a valid priesthood and an efficacious "Institution Narrative"
As a logical consequence, if the Church has no right to change the substance of the sacraments, and She is Indefectible by the Will of Christ (i.e. can not give evil in official teachings and administering the sacraments), then the New "Mass" did not come from the Church! She has no authority to change, so a change means no authority was present in those who presumed to promulgate it (Paul VI) and his heretical successors who falsely claim to hold the papal throne. I do most firmly believe that Novus Ordo is invalid. But, i do not consider it to be Latin Rite. Therefore i think it cannot be judged as Latin Rite. Will Strict Observance Mean Sedevacantism?